Several thousand people, after listening to Christ’s preaching, had partaken of the bread and fish, which he provided so abundantly that a large amount was left over. Although many of them may not have realized what was happening, the miracle had been clear, at least for the Apostles. Once again they were overwhelmed with astonishment. They had already lived with our Lord for some time, and this was not the first miracle they had witnessed. But this one had been produced through them, in their very hands. They had not been mere spectators but actual protagonists. Although the miracle itself was entirely due to Christ, he had worked it with their help—with the loaves of bread that they had offered to him and then distributed among the crowd. The miracle, one could say, had come about to the measure of their generosity in giving the little that they had. Together with astonishment they were also filled with joy. Once again they had experienced our Lord’s closeness. This new experience might not seem so striking for people who were already accustomed to living alongside Christ. But how quick we all are to forget the times when we have been touched by God’s presence—and how surprised and joyful we are when we perceive it anew! How often we see clearly that God is alongside us, that he does not abandon us at crucial moments. And we are filled with joy and a sense of security, not only because something turned out well, but also, and above all, because we realize we are living with our Lord. And yet how often we forget this and give in to the fear that another important matter may not turn out so well—as though God could forget about us, or as though the Cross were a sign that he had turned away from us. After taking leave of the crowds, Jesus asked the Apostles to go to the other side of the lake while he spent some time in prayer. For people with their expertise, the crossing seemed to offer no particular difficulty. And even if it did, after what they had just lived through, what obstacle could seem insurmountable? The boat drew steadily away from the shore, but after some time it began to make little progress. When night fell, the boat was many furlongs distant from the land, beaten by the waves, for the wind was against them. They could not go back, and seemed to be making no headway. They had the impression that the wind and waves—the difficulties—had got the upper hand, and all they could do was try and stay afloat. They were scared. The miracle they had witnessed just a few hours ago now seemed so far off.If only Jesus were with them—but he had stayed on the shore! He had stayed behind, but he had not left them alone or forgotten them. Even though they didn’t realize it, from the hillside he could see the difficult situation they were in, their effort and exhaustion. On beginning the interior life, we can often notice the progress we are making. As we put out to sea, the shore recedes swiftly. But as time passes, and we continue to fight and to advance, our progress is not so obvious to us. What we notice are the waves and the wind, while the shore seems to stay fixed in the same spot. That is the time for faith and abandonment. It is the time to realize that our Lord has not lost interest in us, and to remember that difficulties—the wind and the waves—are a necessary part of life, the life that we have to sanctify, knowing that Christ is close beside us. The experience of God’s closeness, of the power of his grace, does not spare us from having to face difficulties in life. We cannot expect to always feel that he is close by us, nor should we think that, because we are close to God, problems will not weigh us down. But neither should we fall into the mistake of seeing difficulties as proof that our Lord has turned away from us, even slightly or for a short time. On the contrary, difficulties give us the chance to show God how much we love him, how authentic our virtue is. They give us a chance to show our faith in his closeness, and to make him present for others through our joy, our work, and the serene acceptance of setbacks in our life. Peter and the others had been battling against the wind and water, and their own inner turmoil, for hours, when our Lord came to their help. He could have done so in many other ways. He could have solved the problem instantly, or appeared among them in the boat without their seeing him coming. But he had other lessons to teach them, and preferred to act in a way that they could reflect upon afterwards. He came to them walking on the sea. Since it was dark, it was not easy to see who he was. The fact of his coming was extraordinary in itself, but the disciples were already frightened, and fear prevents people from judging events clearly and serenely. Given the circumstances, their reaction was quite understandable: they cried out in fear. Our Lord soothed them: Take heart, it is I; have no fear. He did not calm the wind and the waves straight away, but gave his disciples light to protect their hearts from shipwreck: I know you are going through a difficult situation, but don’t be afraid; keep fighting, and trust in the fact that I haven’t forgotten you, that I’m still close by. Peter’s reaction was unexpected. Lord, he said, if it is you, bid me come to you on the water. Of all the Apostles, it was nearly always Peter who launched out, for good or for bad. He received our Lord’s strongest rebukes, and he also confessed our Lord with a boldness that carried the others with him at difficult times. But his initiative now is surprising even for someone as impulsive as he was. Simon would have to get out of the boat and set foot on the choppy, uncontrollable surface of the water. At a word from the Master, he put one leg over the side, then the other, and he started walking towards our Lord. He wanted to reach Christ, and was ready to do anything to achieve his goal. The resolutions we make to be more generous at times of turmoil should not be mere words. Our trust in God should overcome any indecisiveness or fear of putting them into practice. We need to be able to step decisively, even when there seems to be no solid ground to tread on, in order to walk towards Christ. To advance towards God we have to take risks; we have to lose our fear of storms and be ready to put our lives on the line. As he walked over the water, Peter could feel the wind and waves more strongly than the others. His life depended on his faith even more clearly than theirs, now that he had got out of the boat and was walking towards Jesus. This is the risky situation we Christians find ourselves in. We too are trying to journey towards our Lord in circumstances, both external and internal, that are mostly beyond our control. We are more at the mercy of the waves than those who fear to confront the immensity of the supernatural life and prefer the poor apparent safety offered by their own little boat. So there is nothing strange about our realizing that sometimes we are not on solid ground, and are going through turmoil. That is the time to realize once again that we live by faith—not a faith that calms the storms and removes the danger of walking on the waves, but a faith that gives us light amid the turmoil, and explains the violence of the waves. By faith [the Israelites] crossed the Red Sea as if on dry land; but the Egyptians, when they attempted to do the same, were drowned. Without faith, we are overwhelmed and drown in life’s difficulties. With faith, we do not escape setbacks, but we have more resources to cope with them, and we know that God can make them turn in our favor. The Chosen People must have been terrified to walk across the sea-bed, with the added danger that their enemies might overtake them; but by overcoming their fear, they achieved safety. We end up realizing that the turmoil involved in journeying towards God provides a firmer basis on which to build our lives than the apparent safety of the boat. Man of little faith. Anyone who reads the Gospel is surprised by these words. 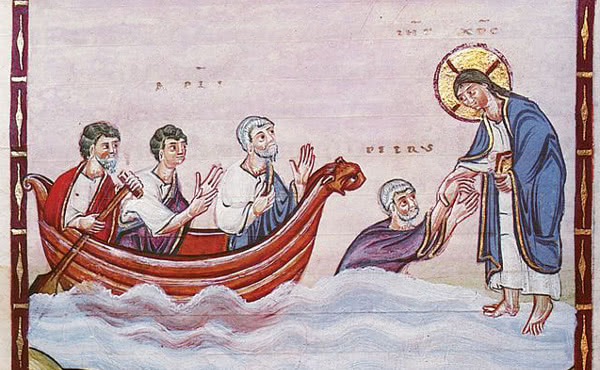 One might even wonder: If our Lord reproves Peter for his lack of faith after he gets out of the boat and begins to walk towards him on the water, what would he say to me? Is there any hope that Christ might one day see a person of faith in me? But if we continue meditating on this scene, other questions may suggest themselves. Was Jesus expecting Peter to walk on the water quite calmly, as though walking on solid ground on a peaceful, sunny day? Do our Lord’s words mean that we have to be untouched and unmoved by difficult situations? No, they don’t, because Christ himself was filled with anguish in the garden when facing something objectively fearful. It was only natural for Peter to feel insecure right from the very first steps he took. What he was doing surpassed his human capabilities, whether or not the wind and waves were stormy. It’s no easier to walk on water in calm weather than in a storm. So where did Peter’s lack of faith lie? Perhaps it was not so much in his sense of insecurity as in doubting Christ. Up until that moment his eyes were on Christ; obviously he felt insecure, but he did not worry too much about it because what was crucial, what took up all his attention, was walking towards his Master. But suddenly he focused instead on his own insecurity and lost sight of Jesus. His insecurity, which was natural and reasonable enough, degenerated into fear. How should we struggle here? By trying to accept that very insecurity, because only thus can we prevent it from becoming the focus of our attention. It shouldn’t matter to us how we feel while we are trying to carry out God's will. Then we will be able to walk towards Jesus through the wind and the waves, without being frightened by the difficulties. St. John writes in one of his letters: There is no fear in love, but perfect love casts out fear…he who fears is not perfected in love. Saint Josemaria liked to translate this as: “the fearful man doesn’t know how to love.” Love and fear belong to different, mutually exclusive orders. They only join forces when love is not perfect. Fear is a sense of uneasiness at the possibility of losing something one has or wishes to have. Insecurity is part of the human condition, since we do not have perfect mastery even over ourselves. Therefore we cannot remove all insecurity from our lives. Otherwise the virtue of hope would not exist: where there is absolute certainty there is no room for hope. The order of love, then, should exclude fear, but not necessarily insecurity or uncertainty. Living in the order of love means that insecurity does not degenerate into fear. It means accepting the insecurity, integrating it within a broader vision of things, within our trust in God, without trying to eliminate it entirely, which we will never be able to do. We can never aspire to absolute security. The insecurity we may experience because of our limited abilities is an opportunity to foster our abandonment in God. Then faith is not seen as a weight but as a light, that shows us the way, that teaches us how to make use of our weakness to open our soul to God. Christians do not hope that God will make them feel sure of themselves, but that their confidence in God will enable them to see beyond their own insecurity. If our view is not confined to our own limitations but, without denying them, goes beyond them, we can truly cast out fear and live in the order of love. With our Lady, we learn to trust in God.